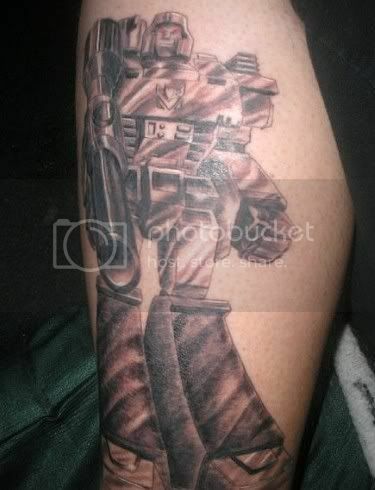 I got another treat in the electronic mail receiving receptacle this week from Nicolas, who shared a photo of his Megatron Transformers tattoo… along with an exuberant description. Staring at you with some BA red eyes threatening to bring out all the decepticons to take you down (don’t act like your not afraid). People see it and they run like an Autobot with it’s muffler between it’s legs (Okay maybe not) It took two sittings to get it done, outlined and then shaded and it hurt like a mother when it got near my calf but it’s worth it. Does me carrying his around make me Starscream or am I safe because he’s not in his gun form? Previous post: A Vampire Attacked My Geeky Cake of the Week!